This is the E12-4 Standard Model Rocket Engines/Motors from Estes. Suitable for Ages 10 & Older with Adult Supervision for Those Under 12. Retail $23.99 SAVE 23% ! These E12-4 motors are much better than E9-4 motors in most situations. The initial thrust is roughly comparable to a D12 (and much better than E9). Use in just about any rocket that specifies an E9-4. Good flights on Interceptor E, Mega Mosquito, Maxi Alpha III. 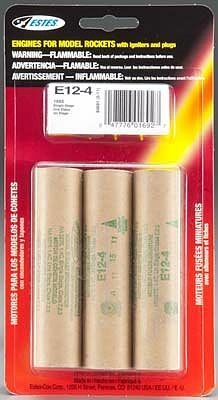 E class model rocket engine pack contains igniters and plugs. Available in blister pack package. "Good motor, but a few issues..."
The motor as a whole was good, the only issues were the fact that the plug provided was much to small. (I had to use a C11-3 plug) Secondly, if you are looking for an E motor to use, Aerotech has much better ones. "Much Better Than E9 Motors"
These E12 engines are much better than their E9 cousins. They are basically a D12 motor with 1 extra second of burn time. The initial thrust of the E12 can launch much heavier rockets than an E9.